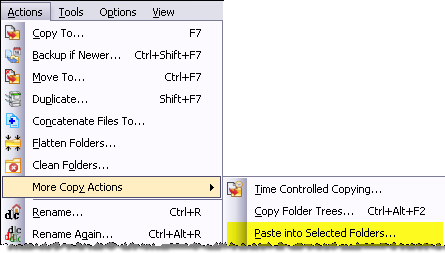 There are two ways to copy files to multiple directories. To copy to just several directories simply list the multiple folders in the Destination(s) field of any copy dialog that accepts a destination. 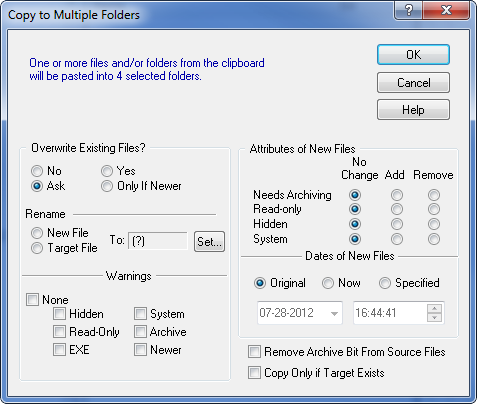 For more about this quick and easy method see Copying files to several folders at once. The rest of this page describes how to copy one or more files many directories: to tens, hundreds and even thousands of folders in one operation. First: Copy the items you want to distribute to the clipboard. Select one or more files or folders to be copied. These can be selected from a normal explorer tab or from a a virtual folder of search results. If you are copying to folders that are all in the same root folder select them in Explore View. If you will be copying to directories on multiple paths, drives or even network drives, create a Dynamic Virtual Folder that will contain your target folders. Select Actions > More Copy Actions > Copy to Selected Folders... from the main menu. Set the options in the controlling dialog as appropriate, press OK and the copying will start.